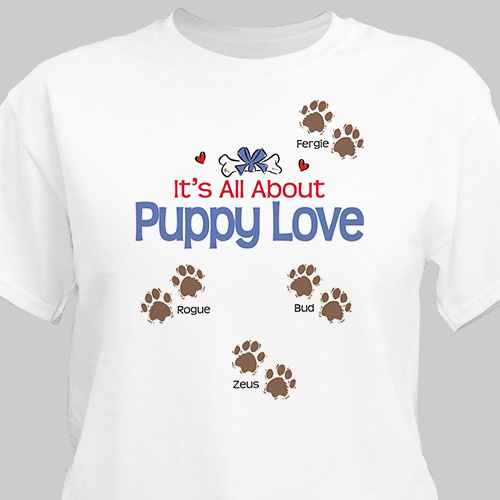 Don’t forget about your four legged Grandkids with our Puppy Love Personalized T-Shirts. This makes a great gift for Mom, Dad, Grandmother or Grandfather to show off their love for their precious little puppies. Our Personalized Shirt is Available on our premium white 100% cotton T-Shirt, machine washable in adult sizes S-3XL. Also available on Ash. Click on image to see larger view. Includes FREE Personalization! Personalize your Puppy Love Shirt with up to 30 dog's names. I have bought shirts from here for over 10 years, they do a great job, and shipping is always fast. Love it. Fits as described. Received quickly.